You know those Cadbury Eggs you pass down the Easter isle of your grocery store and they seem to be calling your name? Well this happened to me last week, lol! 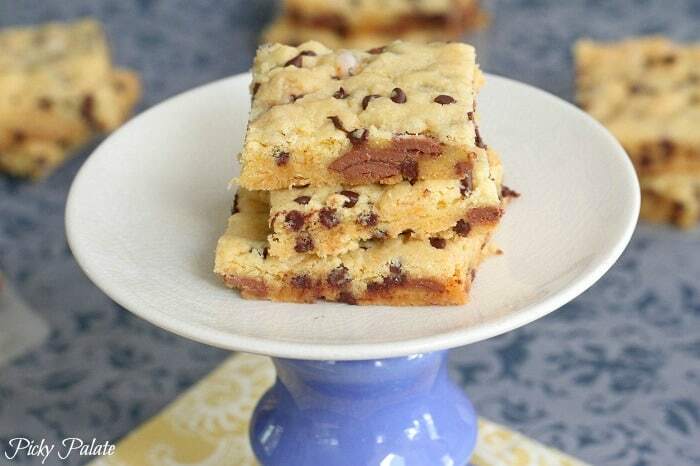 These simple cookie cake bars are absolutely sinful and perfect to perk up anyone’s day. 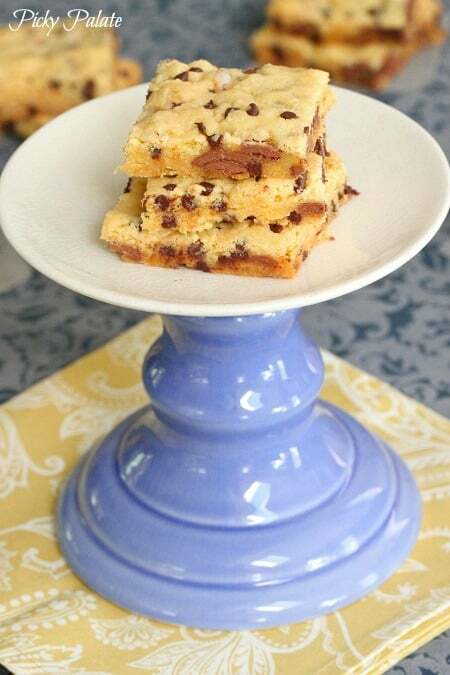 Chopped Cadbury Eggs and mini chips throughout buttery cookie cake bars. It’s a win win if you ask me! It’s a lovely sight, isn’t it? I don’t know if these remind me of being a kid or what, but I love them! 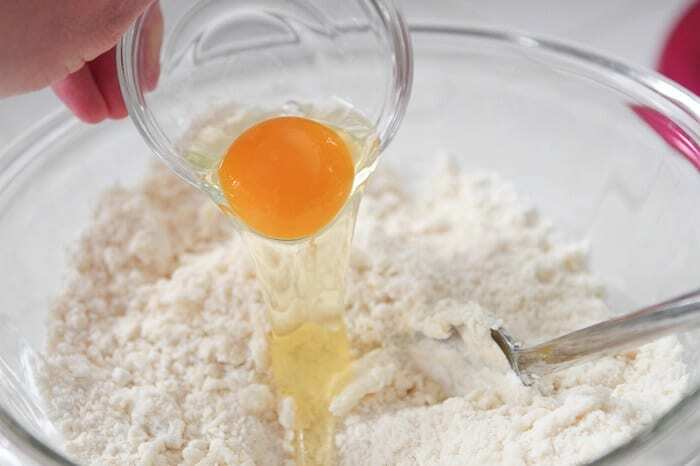 Simple simple….add your cake mix and very softened butter to a large bowl. Add a few tablespoons of canola oil. 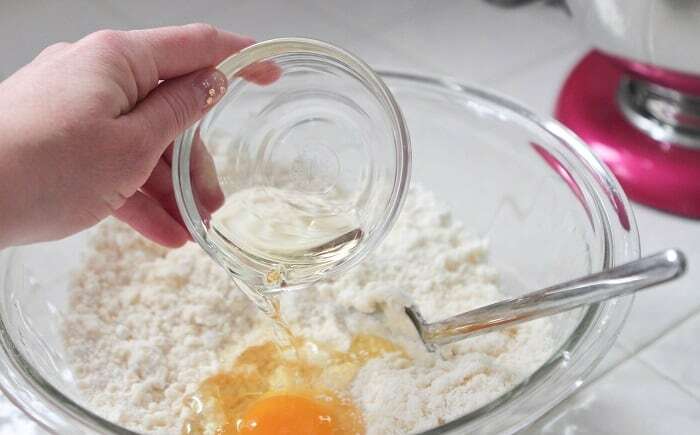 Transfer your dough to a 9×13 inch baking dish. Make sure you don’t mix your Cadbury Eggs too much. You want the ooey gooey centers just barely mixed in like this. The hardest part of the recipe is waiting the 30 minutes to cut them into squares! The gooey Cadbury centers give the bars an almost marshmallow-y consistency. You’ll love these. 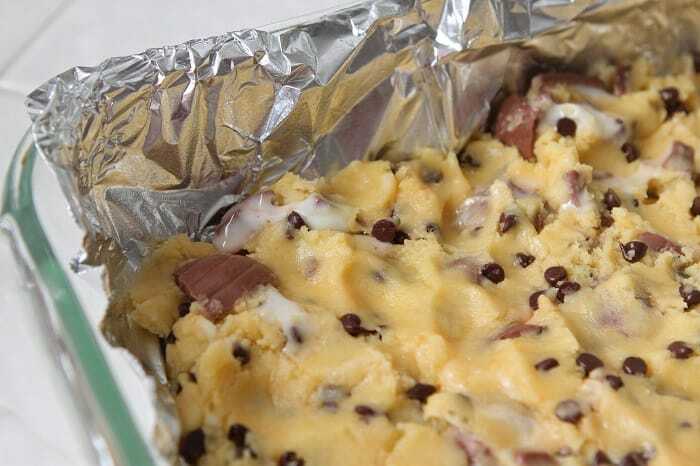 Preheat oven to 350 degrees F. and line a 9×13 inch baking dish with foil that’s been sprayed with cooking spray. 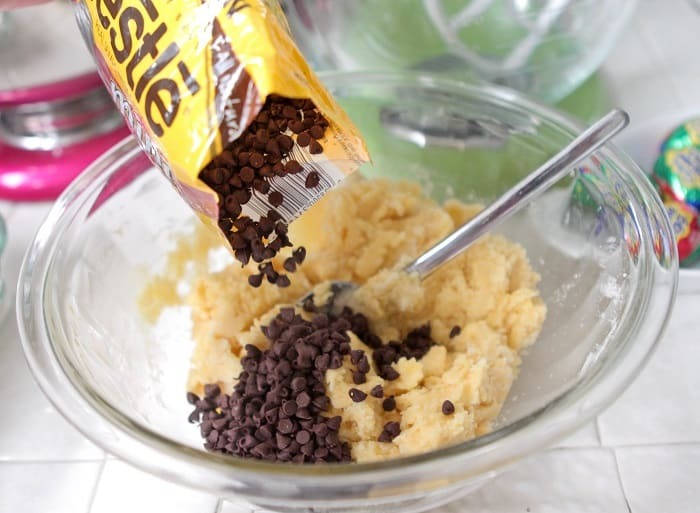 Place butter, cake mix, egg, oil and chocolate chips into a large mixing bowl, stirring to combine into dough. Gently stir in chopped Cadbury Eggs to combine. Transfer dough to prepared baking dish and press evenly. Bake for 25-30 minutes until baked through. Let cool for 30 minutes before cutting into squares. Serve and enjoy! Oh, wow. These would be a huge hit in our house! I actually just picked up some of those Cadbury Eggs at Target yesterday. They’re impossible to walk past! Looks yummy but I would never use canola oil. Best use ever of those Cadbury eggs! I love the mini choc chips too! I’ve honestly never seen a recipe using cadburuy creme eggs before. These look so good and maybe a bit dangerous! I’m afraid I wouldn’t be able to stop myself from eating them all up! I might pop the eggs in the fridge for a while to solidify the centers. I saw that trick with a “Deviled Cadbury Egg” recipe before (basically half the egg topped with yellow frosting and red sprinkles to look like a deviled egg :-)). Adding to my “do eventually” list! Wow, do those sound and look awesome! I need these in my life! Such a great idea!!! These sound wonderful! I never though to use the cream filled eggs in baking! These bars sound so good! 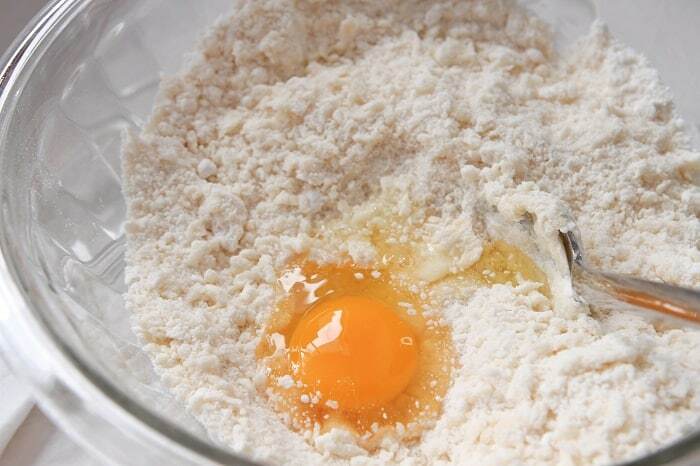 Sorry for sounding thick but what is yellow cake mix? 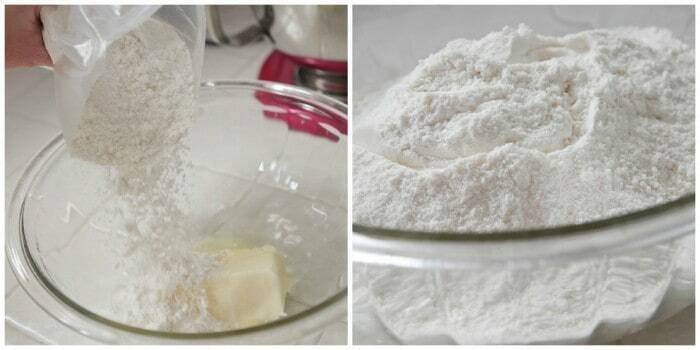 It is a box cake mix…Duncan Hines or Betty Crocker make them. I am not even kidding, I would pay big, big money for these. You seriously just created what I imagine would be my favorite dessert OF ALL TIME. They look divine!! Could I use salted butter instead of unsalted? Would it make much of a difference? The end product will taste a bit saltier. 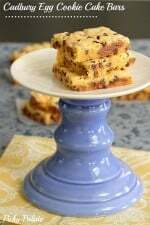 I like salty/sweet desserts, so it wouldn’t bother me, but it’s something to consider. Yum! I haven’t had one of those Easter Chocolate eggs since I was a kid! There’s something about food that brings back childhood memories…all the more delish :). Oh. My. Goodness! 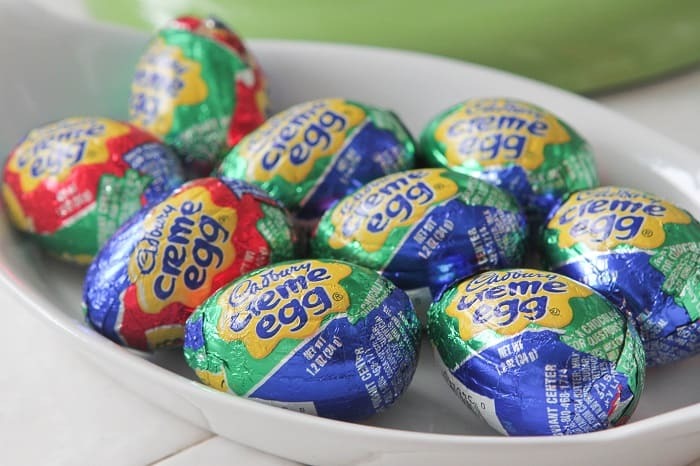 I loooooove Cadbury Creme Eggs – I so need to try this recipe! Thanks for sharing! Danger danger! These look almost too scrumptious. My will power fails me with desserts like this. Oh dear Lordy, these are calling my name! I can describe this is one word for you. “LIFE”!! Lol! I want these sooooo bad! I NEED to make these. Seriously, they look absolutely amazing. Easter candy has been calling me for weeks now! wow, oh wow! 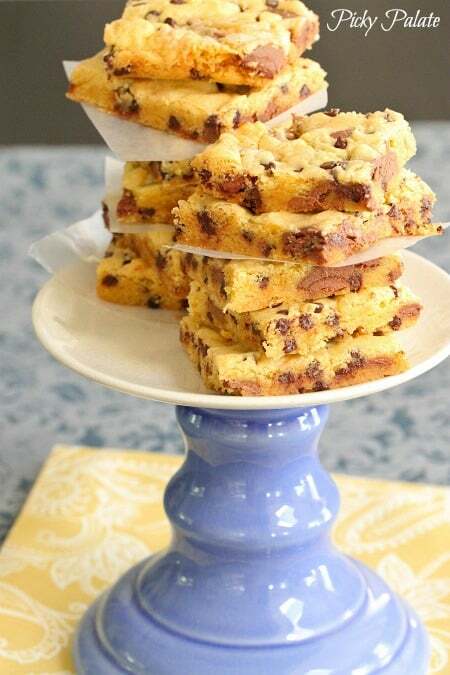 what a brilliant idea to use those luscious cadbury eggs for a cookie bar! they look wonderful, Jenny!! I’ve never been too fond of those Cadbury Creme Eggs, but all mushed up in that delicious batter would be an entirely different story! Those look scrumptious! Do you think you could do the ones with carmel in them? Or does it just need to be the orginal ones for this recipe? Yes, yes, and yes!! These look so amazing. 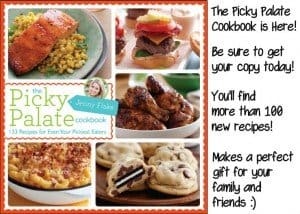 Cannot wait to make them! They look awesome! I tried there.. very difficult to cut. The gooey creme eggs make it a mess. However- wonderfully delicious!! No my God! Ha. These look so adorable and delish! My very favourite – cream eggs – oh goodness. Thank you. What?? Love these – what a great idea. 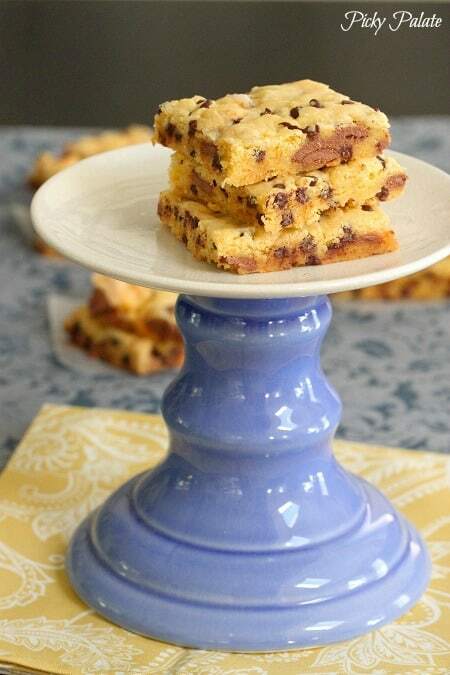 Oh Jenny, these cookie cake bars look amazing! I’ve never used a Cadbury egg in a recipe – guess they don’t last that long. HELL YES. I love these! LOVE Cadbury Eggs ~ Such a fun Easter treat Jenny! How absolutely amazing! 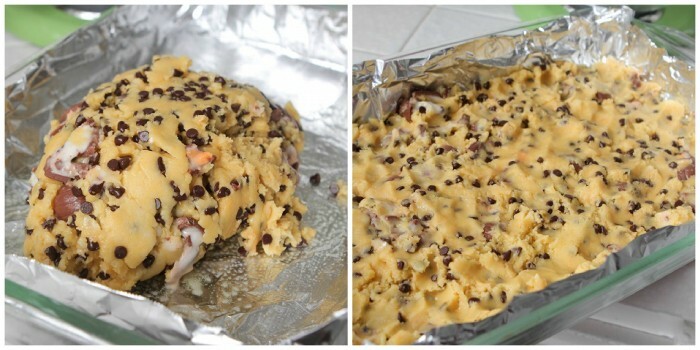 Didn’t you just want to eat the cookie dough?? 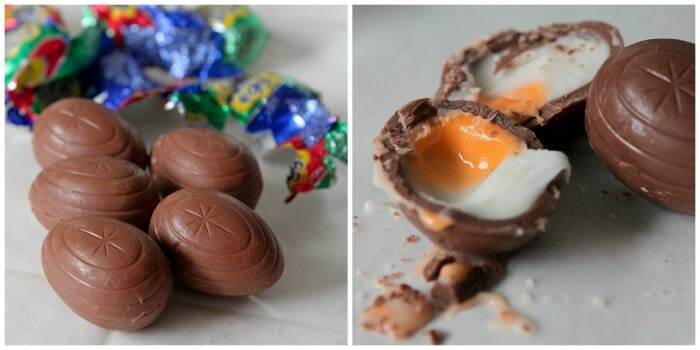 now this is the way I would eat cadbury eggs…these look so perfect delicous. Wow! I love these eggs and feel the urge to make a trip to Cost Plus for some swag. I should introduce my kids to them and carry on our tradition :)Genius. Wow! What a perfect idea! Love it! 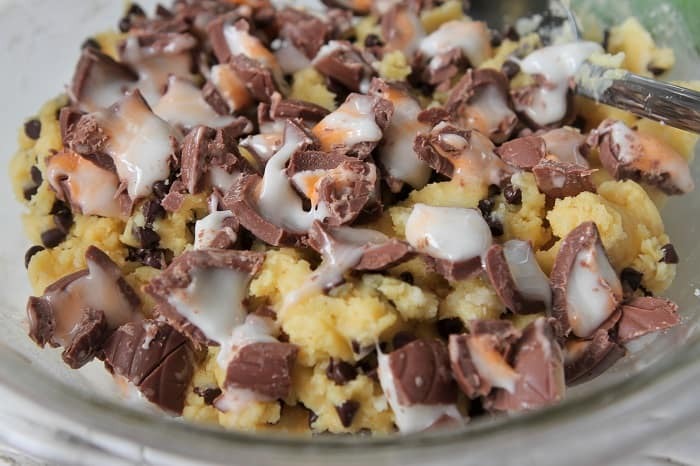 Cookie, cake AND Cadbury Eggs all in one dessert? Yes, please! I made these for my youth group this weekend for Sunday School, and they were a big hit. Thanks!!! Oh so glad to hear it Taylor! Thanks for sharing! Just made this! My daughters will love it after school! I’m unclear how much butter to use by the way its written!